Spacers (Separators): Spacers are plastic rings that are inserted between your back teeth before you have braces, providing space for bands, which are metal rings that go on your back teeth. If a spacer comes out, call our office to see if you need a replacement. Do not chew sticky foods and do not floss teeth that have spacers between them. Elastics (Rubber Bands): Rubber bands are used with fixed metal/ceramic braces. They must be worn as directed and changed per our instructions. Headgear: For severe dental protrusion or retrusion, headgear is sometimes used to restrict or enhance growth of the upper jaw, depending on the type of headgear used. It can also move teeth forward or backward. Forsus: Forsus are springs used to move the upper dental arch backward and the lower dental arch forward, for a combined tooth movement. They are fixed in the mouth, which eliminates compliance, and are usually given if headgear and/or elastics are not being worn as directed. Positioners: Designed to complete the final necessary tooth movements, positioners are usually the last step in the orthodontic process and are not used in all cases. 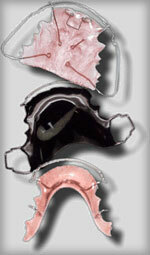 As with retainers, all orthodontic appliances should be worn and cared for as prescribed.